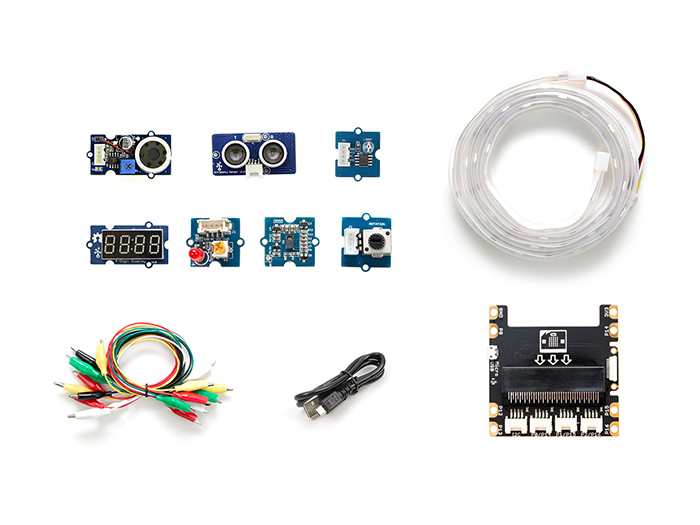 We have already prepared 8 grove modules to let you get started with micro:bit. With these grove modules, you can measure distance and display it, use gesture to play different music, or make a smart guard for your desk or room. We have prepared all the necessary libraries(packages) for free download. If you are a beginner to micro:bit, don’t worry because we have also prepare 12 different project which can teach you step by step. If you are an advanced user, this kit will help you more creative project than others. The output voltage of micro:bit is around 3.0V, use microbit or AA battery to power the circuit may cause malfunction of Grove modules which requires high input voltage and drive current(e.g Grove – Ultrasonic Ranger). In order to make these kind of Grove function well, please use the micro-USB port on Grove shield for microbit to power the circuit. You need to know some essential knowledge if it is the first time that you get involved with Micro:bit. 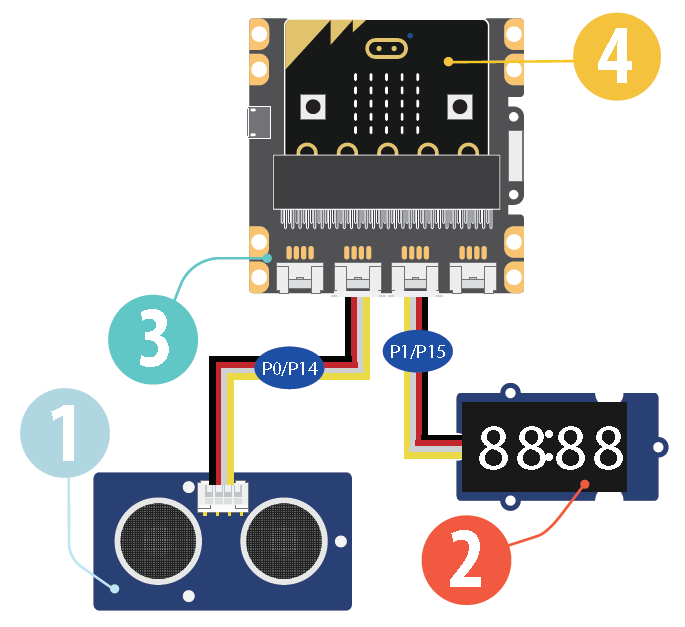 You can click here to see more about Micro:bit. Here are two simple steps before you enjoy our kit, after that we can start program. Now you can find Grove in the toolbar. 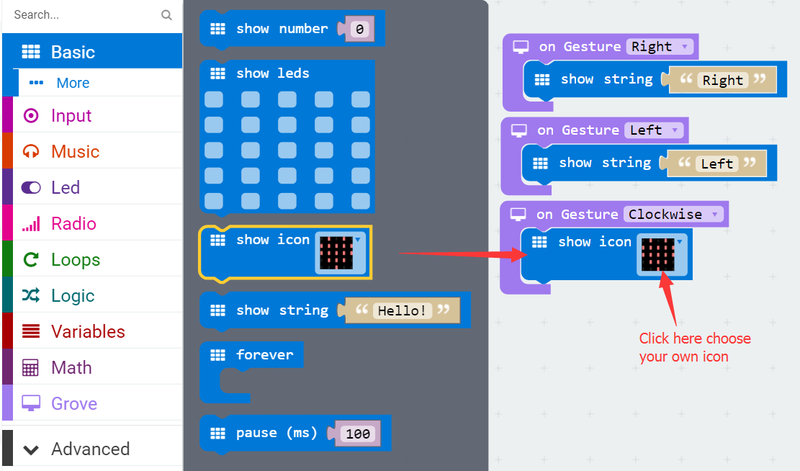 The gesture sensor can recognize 9 different gestures, in this demo, you will learn how to display the recognized gesture name on micro:bit. Plug the micro:bit into Grove Shield for micro:bit. Connect the Grove-Gesture to I2C Port of micro:bit via a Grove Universal 4 pin cable. Connect micro:bit to PC via a Micro-USB cable. -please make sure the LED Array is faced up when you plug the micro:bit, or you may damage the board. Select Right, so that the sensor can recognize when you move your hand from right to the left. 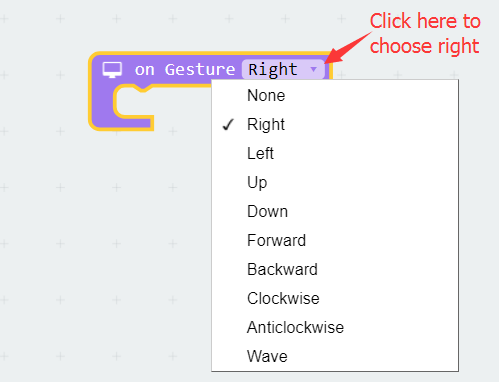 Add Basic block show string and embed it into the Gesture block.Then double click “Hello!”, change it to “Right”. Add “Left” and “Clockwise” the same way, and embed show icon into “Clockwise”. When you finish all this above, rename the project “gesture”. Then you can download the project to your board. 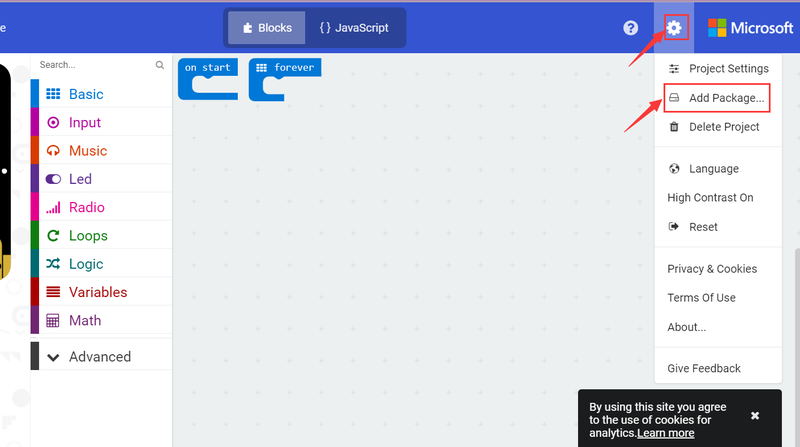 Click Download in the Bottom left corner, download the file microbit-gesture.hexinto the flash of MICROBIT. You can find the blocks by color. For example, if you don’t where show icon is ,since it’s blue and the Module Basic is blue,you can find it here. Simple and effective, isn’t it? In this demo, you will learn how to use the ultrasonic sensor to measure distance and show the value on a display. please make sure the LED Array is faced up when you plug the micro:bit, or you may damage the board. 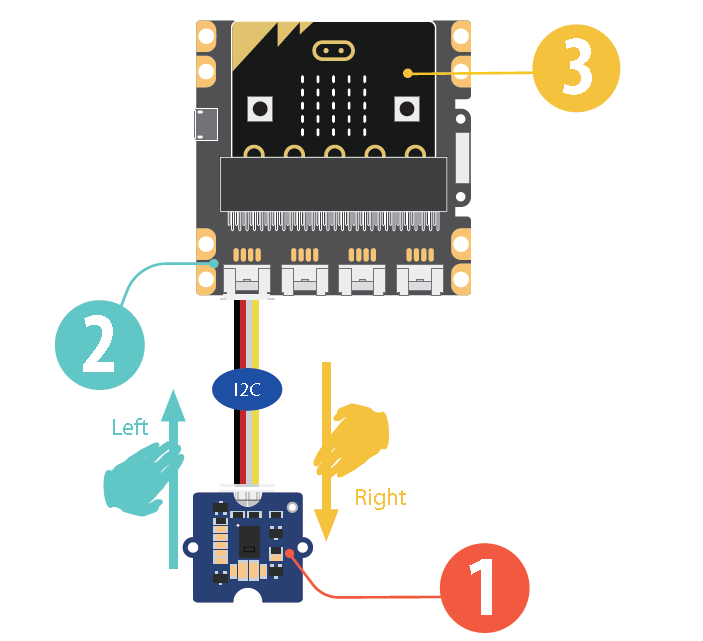 Connect the Grove-Ultrasonic Ranger to P0/P14 Port of micro:bit via a Grove Universal 4 pin cable. Connect the Grove-4-Digit Display to P1/P15 Port of micro:bit via a Grove Universal 4 pin cable. Add basic block on start, then add variable blocks set item to 0, rename ‘items’ to ‘Display’. If you have successfully added the Grove package, replace “0”with Grove block 4-Digit Display at P1 and P15. 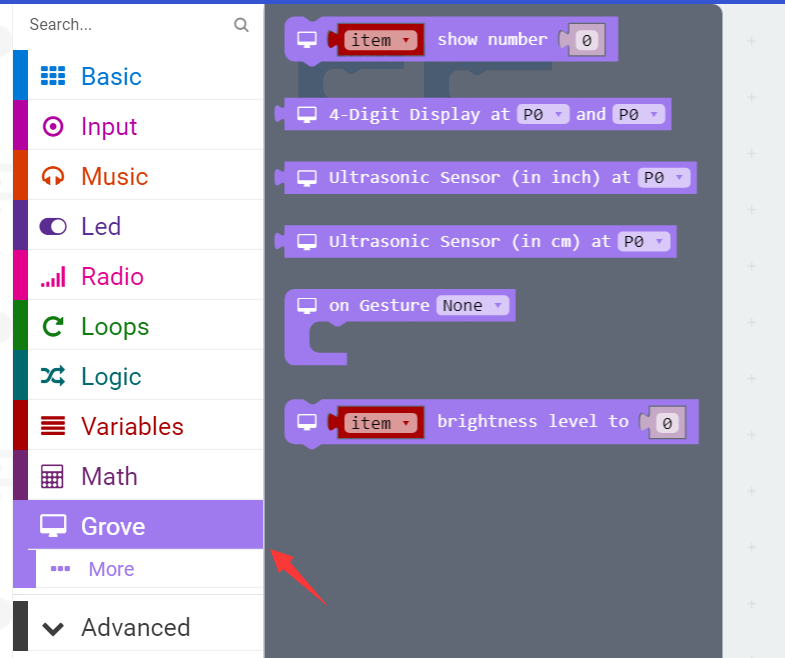 Add basic block forever, then add Grove block item show number 0, rename ‘item’ to ‘Display’, replace ‘0’ with Grove block Ultrasonic Sensor (in cm) at P0. Add basic block pause (ms) (100).